The Chinese-built Miniature Neutron Source Reactors (MNSR, 27 kW) reactors (two in China, five abroad) are low-power, neutron source RRs used primarily for neutron activation analysis, education, and training. These reactors have cores consisting of about 1 kilogram of HEU, enriched to 90% or greater. The IAEA initiated a Coordinated Research Project (CRP) in June 2006 to assist in the conversion of these reactors to LEU. Parallel to the completion of the CRP, a MNSR Working Group has been established consisting of the CRP participants with relevant fuel transport and cask designers/owners as observers. The group is focusing on the coordination of common activities, such as the performance of the MNSR zero power tests, development of a transportation cask for returning spent HEU fuel to China, and the application of IAEA assistance. 1963: Syria joins the International Atomic Energy Agency (IAEA). 1968: Syria signs the Nuclear Nonproliferation Treaty (NPT). Mid- 1970s: The Atomic Energy Commission of Syria (ACES) is established. 1979: The IAEA, AECS and Syria’s Ministry of Electricity begin a nuclear power program feasibility and planning study. 1982: The IAEA and AECS establish a nuclear analytical laboratory (completed in 1990). The IAEA provides systems for atomic absorption spectrometry, X-ray fluorescence analysis, gas and liquid chromatography, fluorimetry and low-level alpha, beta and gamma counting. Five AECS members are trained to use the laboratory. 1982: AECS is a co-founder of the Arab Atomic Energy Agency (AAEA), aimed at developing and transferring peaceful uses of atomic energy in Arab countries. 1984: The IAEA and AECS establish a nuclear training laboratory (completed in 1987). The IAEA provides oscilloscopes, electronic tools and components, a scintillation detector, X-ray and GM counters, neutron sources and chemicals. 1985: Syria negotiates with the Soviet Union for transfer of a 10 MW nuclear research reactor, but negotiations eventually fall through. 1986 – 1992: The IAEA provides Syria with a micro-plant facility to test the feasibility of recovering uranium “yellow cake” from phosphoric acid produced at the Homs fertilizer plant. Syria’s nuclear power program is shelved for financial and contractual reasons. 1990: Argentina reportedly comes close to selling Syria a 10 MW thermal pool-type reactor for isotope production. The deal would have included a radiological protection center and a hot cell for radioisotope fabrication. 1991 – 1998: The IAEA assists AECS with the purchase and installation of a Chinese 30 KW miniature neutron source reactor in the Der Al-Hadjar Nuclear Research Center. 1991: India’s Atomic Energy Commission reportedly offers to sell Syria a light water research reactor. February 1992: Syria signs an NPT safeguards agreement with the IAEA, which allows the IAEA to verify Syria’s declarations of its nuclear material and nuclear-related activity. 1995: Syria approaches Argentina for a 3 or 5 MW nuclear reactor for medical purposes, but Argentina declines the sale due to international pressure. 1996 – 2001: The IAEA helps Syria undertake a pilot plant project to remove uranium from Triple Super Phosphate produced at the Homs fertilizer plant. March 1996: The Miniature Neutron Source Reactor located at the Der Al-Hadjar Nuclear Research Center goes critical. 1997: According to U.S. intelligence, nuclear cooperation probably begins between North Korea and Syria. 1997 – 2007: The IAEA helps Syria build a cyclotron in Damascus. Equipment includes a 30 MV cyclotron machine purchased from Ion Beam Applications in Belgium, a high performance liquid chromatography unit, a gas chromatography unit, a polarograph, a gamma spectrometer and dose calibrator, two lead windows, and two hot cell manipulators. Also included are hot cells and clean rooms. 1997: The IAEA begins to assistSyria with the purchase of an ion beam accelerator and equipment from High Voltage Engineering Europe BV in the Netherlands. February – July 1998: Russia agrees to provide Syria a 25 MW light-water research reactor; the project is abandoned due to lack of finances. February 1999: The pilot plant to remove uranium from Triple Super Phosphate is commissioned. April – August 2001: According to the IAEA, Syria begins to build a secret nuclear reactor at the Dair Alzour site, also referred to as Al Kibar, along the Euphrates River in eastern Syria. 2001: A. Q. Khan reportedly meets with Syrian nuclear officials in Iran to help Syria develop nuclear weapons. 2002: North Korean officials seek to procure a gas-cooled reactor component, which U.S. intelligence believes is intended for Syria. 2002: The cyclotron facility at the Dubaya Center in Damascus is operational. 2004: U.S. intelligence reports that Syria has nuclear research facilities at Der Al-Hadjar and Dubaya. January 2004: Pakistani investigators say that A. Q. Khan offered technology and hardware to Syria, according to the Pakistani press. May 2004: The U.S. Government issues Executive Order 13338 prohibiting the exportation or reexportation of U.S. Munitions List and Commerce Control List items to Syria and freezing assets under U.S. jurisdiction of entities determined to contribute to Syria’s pursuit of nuclear weapons. September 2005: The ion beam accelerator at AECS’ Physics Department is commissioned. November 2005: The U.S. Government amends the Iran Nonproliferation Act of 2000 to become the Iran and Syria Nonproliferation Act, under which companies can be punished for helping Syra build weapons of mass destruction. 2006: According to U.S. intelligence, North Korea transferred cargo to the Dair Alzour area, probably to the reactor site. September 2007: Israel destroys a nearly complete but non-operational Syrian nuclear reactor in Dair Alzour. September – October 2007: Syria commences large scale clearing and leveling of the Dair Alzour site. October 2007: Syrian President Bashar al-Assad claims that Israel hit an unoccupied military compound in its September airstrike. April 2008: U.S. intelligence asserts that the site near Dair Alzour housed a gas-cooled graphite-moderated reactor, similar to North Korea’s Yongbyon reactor, that would have been capable of producing plutonium for nuclear weapons. June 2008: The IAEA inspects and takes environmental samples of the Dair Alzour site. October 2008: Syrian official Fayssal Mekdad declares that three additional sites the IAEA wishes to investigate in connection to the Dair Alzour site are off limits because they are restricted military areas. November 2008: The results of environmental samples taken by the IAEA at Dair Alzour reveal man-made uranium particles produced through chemical processing. 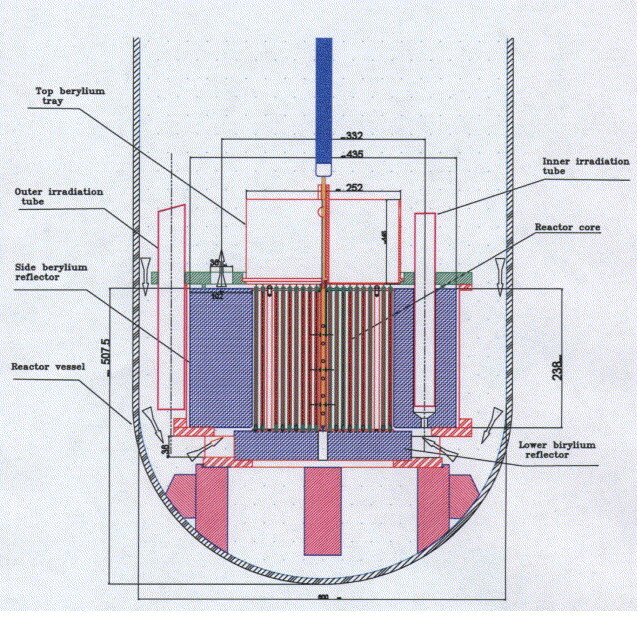 The IAEA also finds the containment structure, size, and water pumping capacity of the bombed structure to have been sufficient for a nuclear reactor. November 2008: The IAEA approves a feasibility and site selection study for a Syrian nuclear power plant. The study will begin in 2009. February 2009: Further analysis by the IAEA of environmental samples from Dair Alzour reveals additional uranium particles not declared by Syria’s nuclear material inventory. The findings are inconsistent with Syrian claims that the particles originated in Israeli missiles used to destroy Dair Alzour. 2009: The IAEA plans to help Syria establish a specialized dosimetry laboratory and to enhance the analytical capabilities of the ion beam accelerator in the AECS’ Physics Department.